The first weekend in April this year will bring a perfect storm of literary and cultural events to the Alamo City: in addition to the sixth annual San Antonio Book Festival April 7, 2018, San Antonio will host the annual Texas Institute of Letters inductions, honoring a songwriter (who but Willie Nelson?) for the first time, in addition to eighteen other inductees; and to mark the 50th anniversary of the first international exposition, or World’s Fair, to be held in the southwestern U.S., HemisFair Park and its iconic 1968 Tower of the Americas will open for a four-day ¡Viva HemisFair! extragavanza. Your Lone Star Literary Life team will be on hand to cover all the action. But San Antonio, as the introduction to the just-off-the-press anthology Literary San Antonio makes clear, has long been a bookish destination deserving of top honors. With its diversity of literary voices, its cultural traditions drawing from many indigenous and colonial backgrounds, and its commitment to preservation, San Antonio richly rewards the reader or writer who comes to explore for a day — or longer. The Alamo — originally known as Misión San Antonio de Valero — is pretty close to being Texas’s mecca, where natives must make a pilgrimage to fulfill their heritage and non-natives have to see what all the fuss and legend is about. The events of the Alamo have continued to beckon writers as well, more than 180 years after William Barret Travis drew the line. Performer and collector Phil Collins has a whole list of books that he recommends about the Alamo—even if Pee Wee Herman’s bicycle has still not been found there. There’s been lots of talk, of late, about plans for restoration of the original battleground layout, and updated interpretation to help visitors better appreciate the significance of the bloody March 6, 1836, assault that marked a crucial turning point in the Texians’ bid for self-rule. Future changes notwithstanding, today it’s easy to walk the grounds and enter (quietly, please) the ancient church, standing where history happened. There is no admission charge, and the Alamo is open daily year-round except Christmas. A gift shop on-site sells books about Texas for all ages. We recommend reading Stephen Harrigan’s assiduously researched novel The Gates of the Alamo before you arrive. Any city is fortunate to have an independent bookstore whose proprietor has served a term as president of the American Booksellers’ Association and who still staunchly upholds the model of hand-selling carefully curated volumes via personal recommendation. 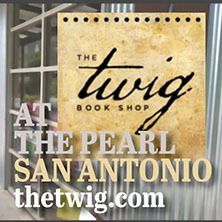 That’s the approach locals and visitors appreciate at The Twig Book Shop 306 Pearl Parkway, #106, now in its third iteration at San Antonio’s historic and trendy Pearl Brewery arts and shopping complex. Proprietor Claudia Maceo stocks top picks from Texana to bestselling fiction, poetry by local and national favorites alike, coffee-table and gift books, and lots of children’s titles. 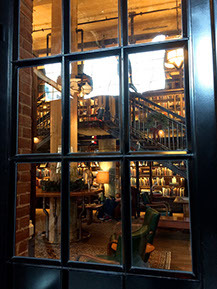 The Twig hosts a robust schedule of author events, either in their store or across the way at the elegant Hotel Emma, the luxurious lodging and meeting space repurposed from the former brewhouse. The boutique hotel houses a 3,700-volume library available for registered guests. But even if you’re not staying overnight, peek into the library before stopping into the bar for a signature Three Emmas cocktail (ask for the full story!) or a La Babia margarita. Rosengren's Books: An Oasis for Mind and Spirit by Mary Carolyn Hollers George, released in 2015 by Wings Press, archives the cultural impact of the legendary former San Antonio bookstore. Rosengren’s was the center of literary culture not only in San Antonio, but in Texas, for decades. The late Willie Morris, the respected author and editor of Harper's Magazine, called it “one of the finest and most admirable bookstores in America”; to Robert Frost, it was simply “the best of bookstores.” Writers as diverse as J. Frank Dobie, John Dos Passos, John Graves, and Larry McMurtry simply loved the place. 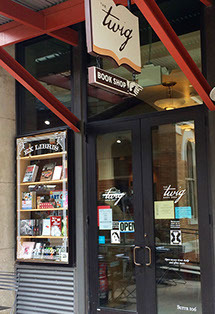 While Rosengren’s is long gone except in fond memory, San Antonio does not lack for other outlets to acquire books, meet an author, connect with writers and fellow fans, or enjoy ambience and refreshment. Nine Lives, 4907 NW Loop 410 #102 in the Village at the Summit, trades in used books and has been a popular haunt for bookish bargain hunters since way back when it was in a previous location with a succession of feline mascots who gave the shop its name. Don Hurd’s Imagine Books and Records hosts ImagineFest III (music) on March 11, 2018. Comics fans are well served by Alien Worlds, two Dragon’s Lair Comics & Fantasy stores, Heroes & Fantasies (which also has a 350-seat game room), across the way from Nine Lives; Collectors Authority; and Bazinga Comics. Greater San Antonio also boasts five Barnes & Noble stores, five Half Price Books, and a Books-a-Million, as well as a LifeWay Christian bookstore. The city’s many world-class museums, including those at the Witte Museum, the San Antonio Museum of Art, the Institute of Texan Cultures, and the Briscoe Western Art Museum carry extensive selections of books in their museum stores as well. Just outside San Antonio proper, readers will enjoy visiting Hill Country Books in Boerne, the Purple Chair in New Braunfels, and the granddaddy of Texana and collectibles, Wolfmueller’s in Kerrville. San Antonio, as the birthplace of the Texas Republic and a cultural crossroads for centuries before that, beats today as the heart of Texas’s multicultural literary life. With guest reading series and appearances at the city’s institutions such as the University of Texas at San Antonio to Our Lady of the Lake University, University of the Incarnate Word, and St. Mary's University—to name only a few—the city offers rich and regular opportunities for listening and interacting. Gemini Ink, home to vibrant books-and-author series, workshops, book sales, and spoken word events, brings writers and readers together at 1111 Navarro Street. The organization, under director Sheila Black, offers a regular schedule of classes on-site and also heads up the Writers in Communities program throughout the city. Grass-roots cultural organizations such as the Esperanza Peace & Justice Center and the Guadalupe Cultural Arts Center, 1301 Guadalupe St., host literary events. Even if you’re visiting San Antonio on a day when events aren’t scheduled, it’s worth a drive through the city’s in-town West Side to appreciate murals and street art. Many renowned writers past and present are connected with San Antonio, which one pundit claimed in 2009 “would never be known as a book town.”* The city has more than redeemed itself. 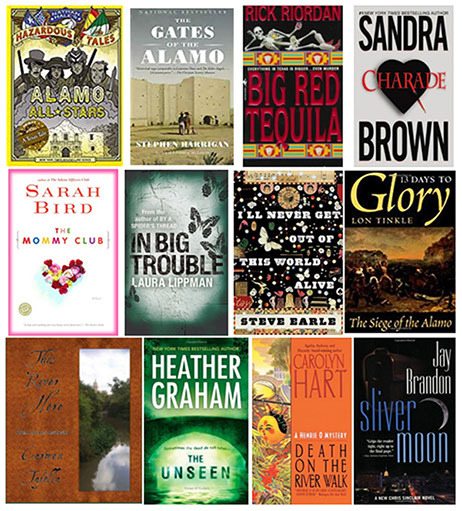 ALAMO CITY AUTHORS Right, from upper left: authors associated with San Antonio include Jan Jarboe Russell, Bryce Milligan, Laurie Ann Guerrero, Max Lucado, Carmen Tafolla, Rick Riordan, Whitley Strieber, Leila Meacham, Lewis Fisher, Naomi Shihab Nye, Gregg Barrios, Barbara Ras, Steve Earle, Laura Lippman, Bill Sibley, Nan Cuba, Jenny Browne, Andrew Porter. Latina author and MacArthur “genius grant” winner Sandra Cisneros has for three decades been most closely associated with her adopted hometown of San Antonio—as much for her championship of Latino/a culture here as the ways she captured Tejano life in works such as Woman Hollering Creek and Other Stories and the novel Caramelo. After finding first fame with The House on Mango Street, set in her native Chicago but published by Houston-based Arte Público Press in 1984, she established the Macondo Workshops to build community and social change through art and writing. The workshops, and the Macondo Foundation, continue today under the local Guadalupe Cultural Arts Center. Cisneros’s once-controversial purple-painted house (now a more sedate rose color), at 735 Guenther St. in the King William Historic District, sold in 2015 some while after the author’s long-announced move to Mexico. Cisneros’s work figures prominently in the 2015 anthology Her Texas, only one acknowledgment of the influence this author and state have exercised over one another; her 2016 memoir A House of My Own: Stories from My Life presents her reflections in a series of essays. 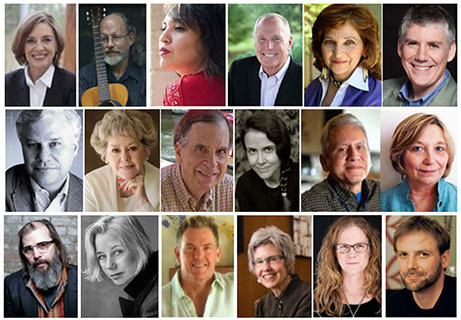 Poets Gregg Barrios and Naomi Shihab Nye also call San Antonio home, as do authors Nan Cuba (Body and Bread), Sheila Black, novelist/playwright/screenwriter Bill Sibley, novelist James R. Dennis (one-third of the writing team that goes by Miles Arceneaux), Christian author Max Lucado, and fiction writer Andrew Porter. Rick Riordan (The Lightning Thief) formerly called San Antonio home. San Antonio novelist (and native of the West Texas oil-patch town of Wink) Leila Meacham proves it’s never too late to pursue your writing dreams. Her novel Roses, often described as a Texas Gone With the Wind, was published in 2010 when the author was 65 and has now sold more than a million copies. Meacham followed it up with Tumbleweeds and Somerset, also Texas bestsellers, and Titans was released in 2016. Perhaps the best-known writer from San Antonio’s past honed his craft here more than 130 years ago—short-story master and temporary Texan William Sidney Porter (right), later and better known by the pseudonym O. Henry. 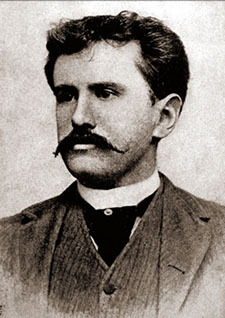 The North Carolina native, who came with his father to a friend’s Texas ranch in 1882 and spent a year writing and publishing a humor rag in a two-room German stone house on San Antonio’s Presa Street in 1885, drew deeply on his varied experiences in the Lone Star State (read more under Austin). Today you can visit the tiny house, relocated along with its Texas historical marker to the corner of Laredo and Dolorosa Streets, where O. Henry first published The Rolling Stone. Publishing still flourishes here in the twenty-first century. In addition to Wings Press, which the Bloomsbury Review called “The best little publishing house in Texas,” Trinity University Press, now under the direction of Tom Payton, publishes authors such as cultural historian Rebecca Solnit, National Book Award–winning writer Barry Lopez (who also does a regular stint as visiting writer at Texas Tech in Lubbock) and Pulitzer Prize–winning poet W. S. Merwin. In December 2014 Trinity acquired the assets of Maverick Publishing Company, founded by San Antonio historian, author, and former newspaperman Lewis F. Fisher, and launched a new imprint, Maverick Books, which includes the backlist of the original Maverick line while building a larger list of titles committed to the history and culture of Texas and the American Southwest. In a city known for its colorful arts culture, book arts thrive as well. At the Southwest School of Art, the Paper and Book Arts Department offers both traditional and explorative classes at all levels in papermaking, bookbinding, decorative paper techniques and letterpress printing. Papermaking and Book Arts classes are held in the Picante Paper and Book Arts Studios located on the second floor of the Navarro Campus. Many of San Antonio’s institutions of higher learning bring both local and world-renowed authors to read and sign their works. hosts a regular Creative Writing Reading Series, and the quarterly poetry and arts magazine Voices de la Luna serves as a platform for all authors and artists to share their work in a variety of ways. Spoken word in San Antonio includes PuroSlam, the only nationally certified poetry slam operating in the city. Started in 1999 by Benjamin Ortiz, PuroSlam has earned a national reputation as one of the toughest, roughest, rowdiest poetry slams in the United States, bringing the exciting world of performance poetry to South Texas on a weekly basis. In and around San Antonio, the Indie Book Fest, the Alamo Comic Con, the UTSA Storytelling Festival, and the Boerne Book & Arts Fest bring bookish fun and inspiration to readers of different interests and ages. But there is truly something for everyone at the San Antonio Book Festival, which will take place Sat., April 7, 2018, from 10 am to 5 pm at the Central Library and the Southwest School of Art. The festival is presented by, and benefits, the San Antonio Public Library, a system comprising a central library and twenty-four branches. In a city known for its traditional Southwestern styles of architecture, many viewed the plans for a new downtown library and its “Mexican Modernist” design in 1995 with skepticism. 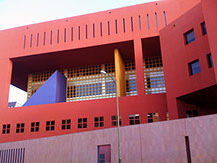 But now the six-story, 240,000-square-foot Central Library building at 600 Soledad, easily recognized by its “Enchilada Red” color, has become an icon of the city. 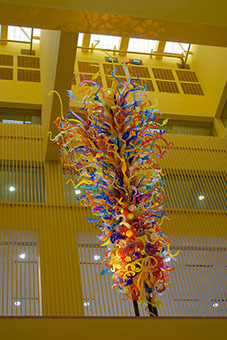 The library provides a printed guide to its numerous public art works, such as the Dale Chiluly glass chandelier (). The San Antonio Conservation Society, 107 King William St. in one of the city’s premier historic residential districts, preserves a collection of documents and artifacts “that document the history of San Antonio and South Central Texas with an emphasis on historic buildings, objects, places, and customs,” according to it website; the library is open to the public. In 2015, Bexar County (of which San Antonio is the seat) took a bold step toward meeting the information needs of its community, with the world’s first all-digital public library. 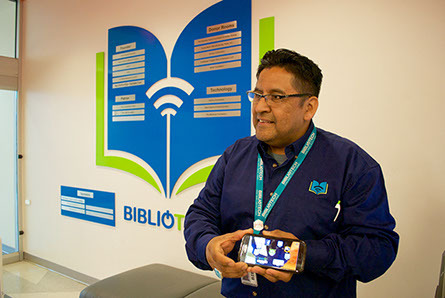 Bibliotech, 3505 Pleasanton Rd., has now expanded to three branches and has attracted imitators from across Texas and around the nation and globe. Some fifty Macintosh workstations loaded with Apple and Windows programs provide access to more than 30,000 (and growing) digital books. Not only may library card holders anywhere in Bexar County check out an e-reader to take home, within the library itself they can take advantage of software training, online documents assistance, homework coaching, study rooms, document printing, 3D design and printing, and a children’s center, and a snack bar. After-work ours are convenient for those who hold daytime jobs. A mobile app provides a virtual tour when patrons walk in the door, but it’s likely a staff member will offer a personal greeting and tour first. 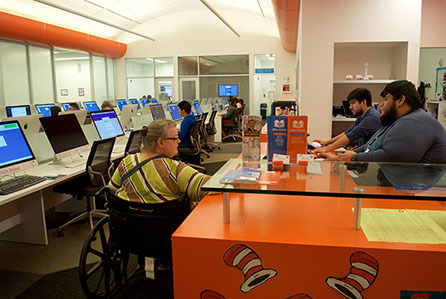 Bibliotech welcomes visitors from near and far to stop by, even if they’re not cardholders. Here’s to another 300 years of lively history and creativity, San Antonio. Bookish visitors: whenever you’re ready to come to San Antonio for business, study, or pleasure, VisitSanAntonio.com provides up-to-date information on lodging, dining, events, and other travel concerns. Throughout the tricentennial year, event details are available at www.sanantonio300.org. Be sure to consult the San Antonio Express-News daily and the San Antonio Current weekly for the freshest dispatches from this old, old city. TECH TALK: Bibliotech’s friendly and knowledgeable staff strive to make their all-digital public library a welcoming place.